The coldest record of the weather this winter is renewed everyday after last ‘Jikou’ season though we don’t feel the cold worse as we felt few days ago. We are surely getting used to the cold weather as well as our feelings not motivated on hearing the temperature that lowers day by day. Still, on a cloudy and gloomy day like in Tokyo today, we wish that there will be sunshine between the thick clouds, at least on a time that we have to go out. Now, everybody outside have something warm to wear when they go out in Japan but cannot let go of the eager wish for the warm season to come as soon as possible. The Japanese ancestors should have hoped for the time to pass fast, for the spring to arrive, as we do today. They were keen on finding glimpse of spring even on snow or in parts where they cannot see to comfort and cheer themselves up, telling themselves that they won’t have to bear the cold weather that long. The season’s phrase today is another hope for the spring’s arrival. It’s about ‘Kiji’, the Green PheasantW, a bird that has been well-acquainted to the Japanese and a national birdW of Japan. You can find the bird as a material in many Japanese paintings as it is one of the most colourful birds in Japan. It was also thought to be a lucky bird, especially with albino pheasants, that the name of an era was changed when the white pheasant was caught and offered to the Emperor. The next following word, ‘hajimete’ is and adverb meaning for the first time. The last word is ‘naku’, a verb meaning to tweet or to call. So, the meaning of the whole phrase would be Green pheasants start to call. 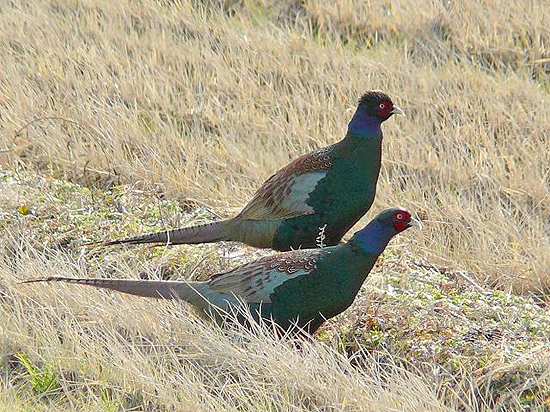 Two beautiful-looking male green pheasants in January. Photo from ‘Kimama-ni-my way‘ by Rakko. Green pheasants’ calls were an interest of the people in the past before scientific equipment to estimate earthquakes in Japan as they believed the male pheasants call sharp foretelling the earthquake. But the call of the pheasants at this time of the year is usually of the courtship, for the female pheasants, reminding that the spring is coming near. On 15th January, there are some places that still celebrate the ‘Koshougatsu’ custom. We named the title of this chapter in English, ‘First Full Moon FestivalW’, to give you the basic idea of how the festival begun. Still, not many Japanese now know that the ‘Koshougatsu’ custom originates to the full moon festival in China. About 50 years ago, ‘Koshougatsu’, literary meaning ‘little or small New Year’ celebrations were more distinct compared to today as the celebration is related on farming and harvest. Some places celebrate Koshogatsu with decorations made from small pieces of rice cakes made into balls and coloured, stuck onto tree branches made to look like cocoons of silkworms called ‘Mayu-dama’, wishing for good silk harvesting. 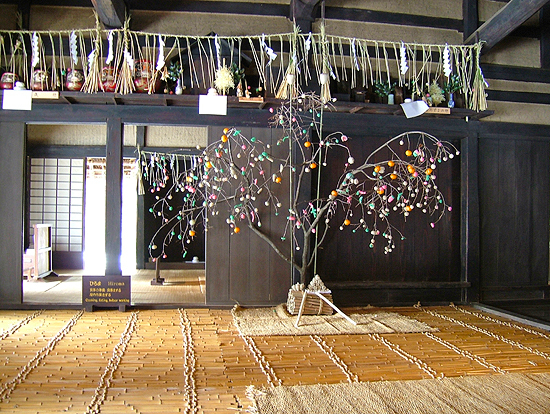 ‘Mayudama’ decoration in an classical farmhouse. Photo from ‘City of Kawasaki Official Site‘. There are some places where women are free from the hard work of preparations and giving welcome to ToshigamiW, the year god in their house. They call the ‘Koshougatsu’ as ‘Onna shougatsu’, meaning, women’s New Year. Women of Edo period celebrating ‘Koshogatsu’ under the ‘mayudama’ decorations. Picture from ‘Kabuki Za Official Site‘. The typical dish of ‘Koshougatsu’ is a congee with Azuki beans. This tradition was said to be started in the Imperial Court in Heian periodW which was a custom in China on the first full moon of the New Year to get rid of the evil powers inside and outside people’s body. The custom originates also to the ‘Nanakusa-no-sekku’. Shijimi as a soup stock is delicious with misoW made into shijimi miso soup. 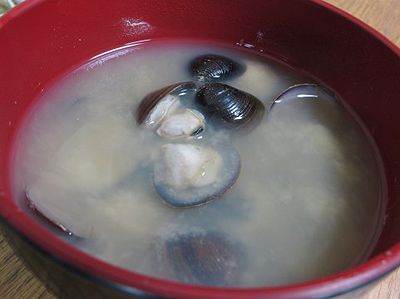 It is said to have good effect on hangovers as Shijimi contains many OrnithineW which works effectively on liver. Many supplements related on Shijimi, effective on liver of the people who drink a lot, are sold in Japan. Some housewives cook their own Shijimi miso soup for their darling husbands when their husbands have to attend many business meals with alcohol at the end of the year or in the beginning of the New Year. 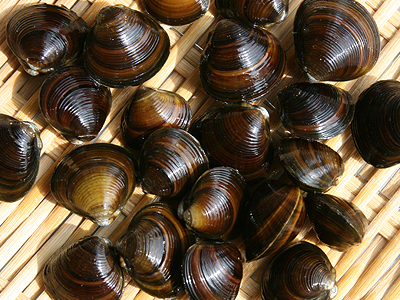 It is also said to be good for anemia as it contains many iron. Shijimi is also boiled down in soy sauce as preserves called ‘tsukudaniW’ which was one of the major side dish in past Japan. 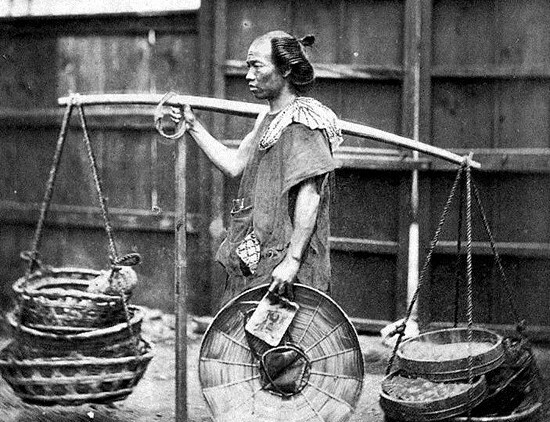 Photo of a peddler of late Edo period to early Meiji period. Shijimis were sold among streets by pedlers. Shijimi has long been a power food in Japan, common, and were read a lot as a seasonal word in HaikuW and other Japanese classic poetry as ‘Kan Shijimi’, pointing this time of the season. Shijimi soup. Good for hangovers!